Researched Nutritionals Co-Q10 Power™ is now GMO-free & Soy-free which incorporates GMO-free sunflower lipids and a new high quality annatto plant natural coloring to provide this extra-clean, high absorption product. Suggested Use: As a dietary supplement, take one to three softgels per day or as directed by your healthcare professional. Free of corn, soy, sugar, salt, preservatives, eggs, fish, crustacean fish, tree nuts, peanuts, wheat, gluten, casein, artificial flavors, artificial colors. 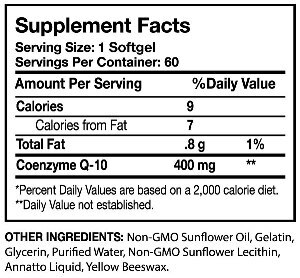 Non-GMO Sunflower Oil, Gelatin, Glycerin, Purified Water, Non-GMO Sunflower Lecithin, Annatto Liquid, Yellow Beeswax.